The Tánaiste Simon Coveney has spoken by phone with the acting White House Chief of Staff Mick Mulvaney. The two men discussed Brexit, E-3 visas and Aughinish Alumina. Simon Coveney is in Washington this week for a series of meetings, with Brexit high on the agenda. Last night, members of the US Congress warned that any return to a hard border on the island of Ireland could threaten a post-Brexit trade deal between the UK and the US. He said he has expressed his concerns about a hard border to the US Trade Representative, the official who advises the US president on trade deals. 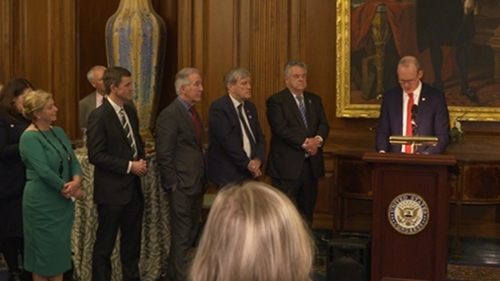 Republican Congressman Pete King said that if the UK wants to consider any type of trade agreement with the US, it is important that the soft border be maintained. Speaking at last night's event on Capitol Hill which Mr Coveney attended, he said he has expressed his concerns about a hard border to the US Trade Representative, the official who advises the US president on trade deals. Mr Coveney said he was not in the US to lobby against the UK or to ask anyone to take sides, but rather he wanted people to use their contacts to ensure that nothing is done to threaten the peace process. He also discussed Brexit with US Secretary of State Mike Pompeo yesterday. The Tánaiste said they had a conversation about protecting the peace process and ensuring that Ireland does not become a casualty of Brexit. Earlier this week, a group of prominent Irish-Americans wrote to Taoiseach Leo Varadkar and British Prime Minister Theresa May expressing alarm over the future of the Good Friday Agreement.